They say 'imitation is the sincerest form of flattery'. It might be true, unless you're Blobby. Then it's the sincerest form of mockery. ....but mockery with a message. A month is a millennium in a news cycle. Hell, news cycles don't last that long. So it's been over a month since Melanoma wore her now infamous $29 Not Caring Jacket®. 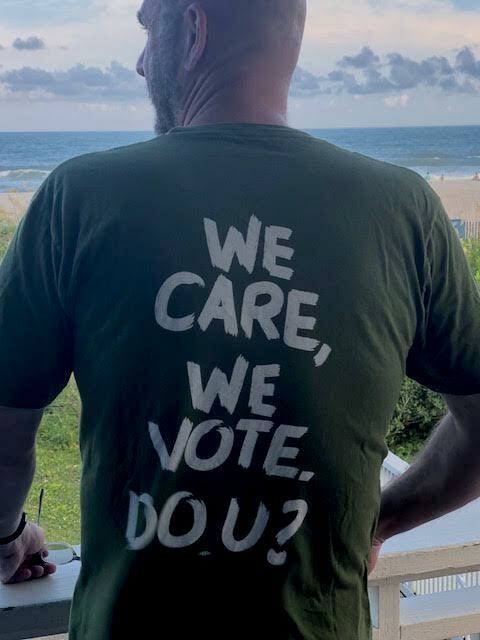 I will give the Dems this, they got right on it and offered the shirt I now wear, but it took four weeks to get it in my hands. A lifetime. I'll say - it was questionable to wear it on vacation. This is North Carolina, after all. As I'm not in Charlotte or Ashville, I think I could be deep into BLOTUS country. Wrightsville Beach has a surfer / redneck vibe going on here. I could easily be beaten and dumped in the ocean. Still, it is important to send the message. It cost me all of $20.18 (plus shipping). I even threw in a $10 donation to the dems to do with it as they wish - though I'm 99% sure they won't use it wisely enough. I no longer see the shirt on the Dem's on-line store. Maybe it was a limited offer. Maybe they're out of stock. Or maybe they don't really care. To be worn proudly, with defiance - and an FU attitude. I'm in the South, but it's a huge city, so I think I could wear one safely. But then again, my mom's car was keyed more than once when she had an anti-war bumper sticker a few years back, so who knows?